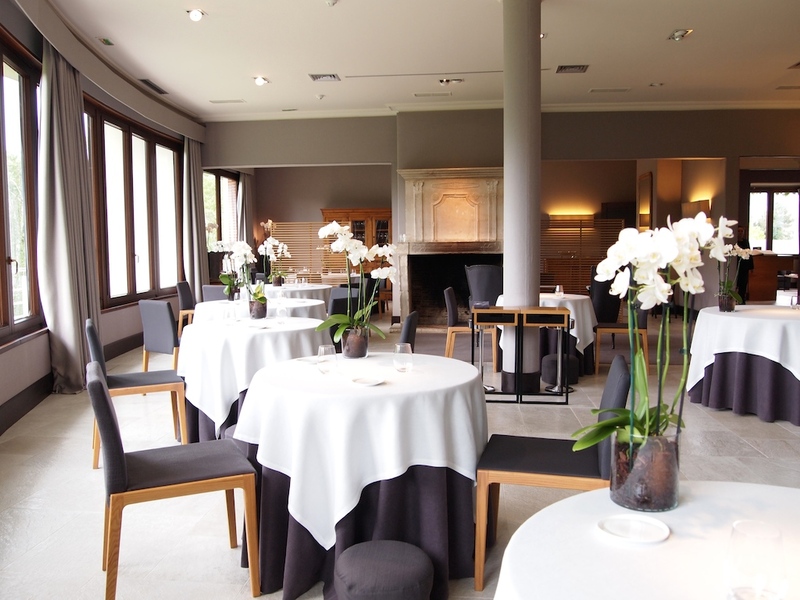 With 14 years of three Michelin stars, Martín Berasategui's eponymous restaurant in Lasarte-Oria is the second longest running three-star restaurant in Spain, behind Arzak in San Sebastian, which has had held three Michelin stars since 1989. 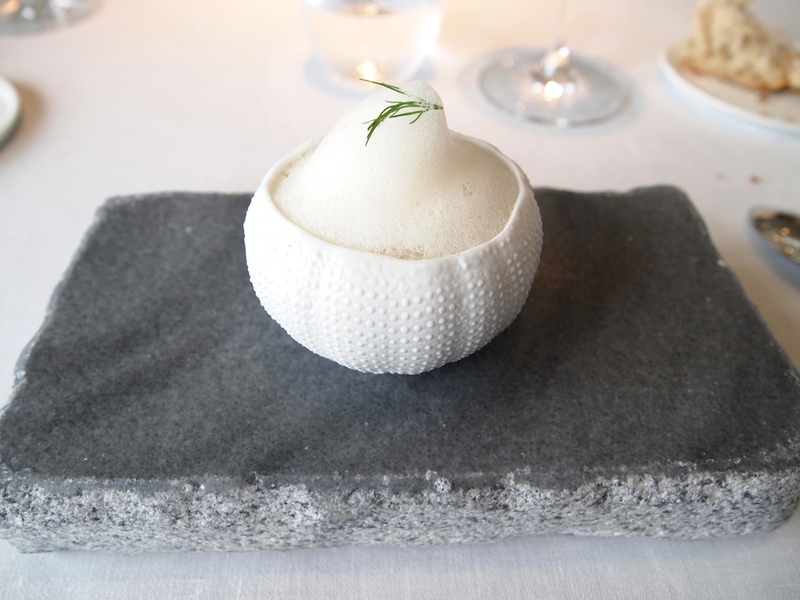 Apart from his flagship restaurant in the Basque Country, Martín Berasategui (b. 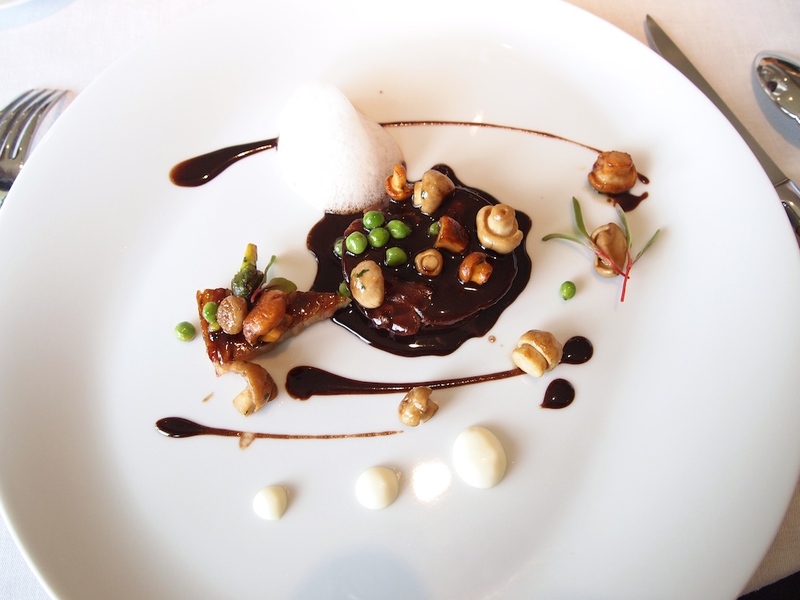 1960) has 10 other restaurants, including Lasarte in Barcelona (2 Michelin stars) and restaurant M.B. at the Ritz-Carlon in Tenerife (2 Michelin stars). His other restaurants are located in Bilbao, Donostia, Mexico and the Dominican Republic. Restaurante Martín Berasategui is open for lunch Wednesday through Sunday and for dinner Wednesday through Saturday. 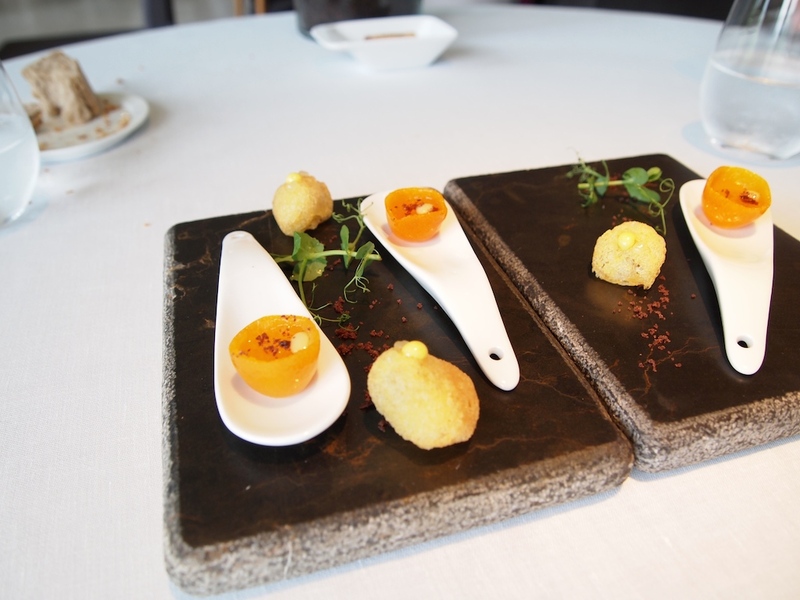 The restaurant offers an a la carte menu which features Berasategui classics and more recent dishes, with a mention of the year in which the dish was created. Starters are priced at €42, mains at €68 and desserts at €30, all excluding VAT. There's also the 9-course "Great Tasting Menu", currently priced at €205. 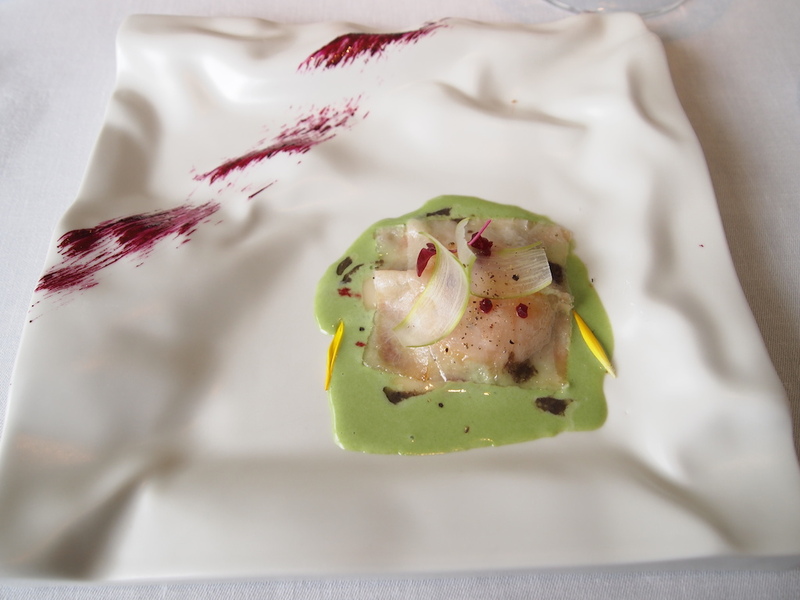 I had lunch with my husband and a friend at Restaurante Martin Berasategui on Friday 15 May 2015 and we all had the Great Tasting Menu, at the time priced at €195. On the day I visited the tasting menu included lamb, which I requested to be replaced by a rabbit dish. Lunch started with two lovely canapés. There was a warm and crunchy beignet filled with a smooth Txakoli wine mayonnaise, and topped with some citrus gel. Followed by a halved kumquat filled with olive, anchovy, and Aquavit jelly. 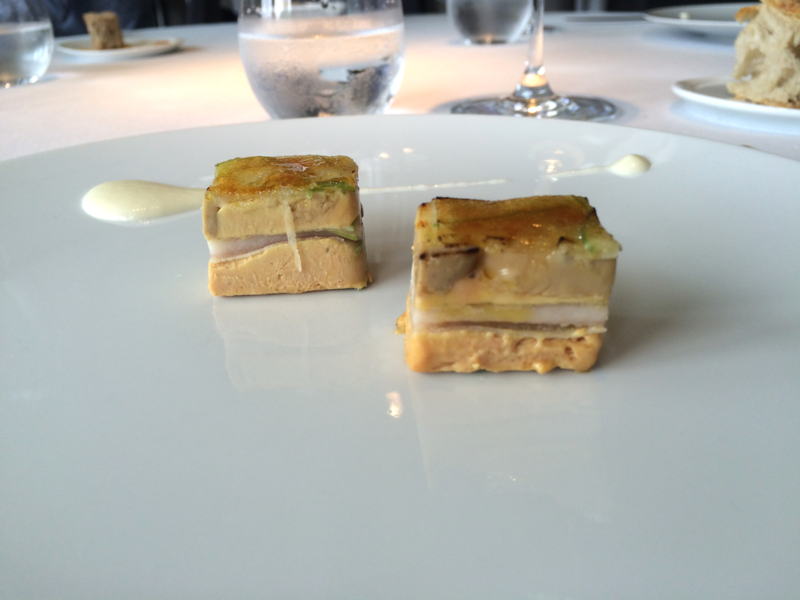 Next to arrive was Berasategui's classic amuse bouche: foie gras, eel and caramelised green apple mille-feuille, served with a spring onion flavoured cream. Delicious, literally layered flavours and textures. Lovely moist eel, followed by the velvety foie gras and the slightly crunchy caramelised apple, the latter adding a nice sweet touch. 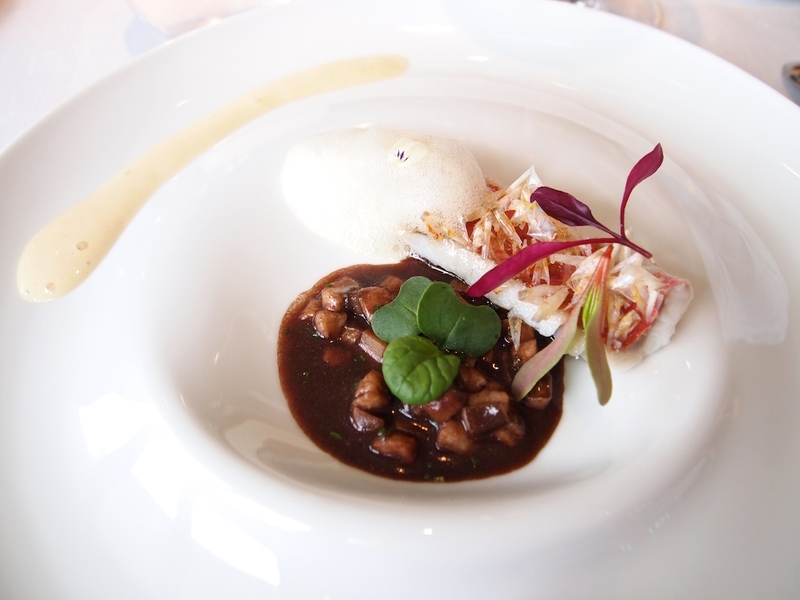 This was followed by "Red Shrimp Royale", delicately sweet red shrimps served in a creamy royale sauce with lentils and topped with a fennel foam. Very refined flavours and I loved the intensity of the royale sauce that also had a lovely thick consistency. 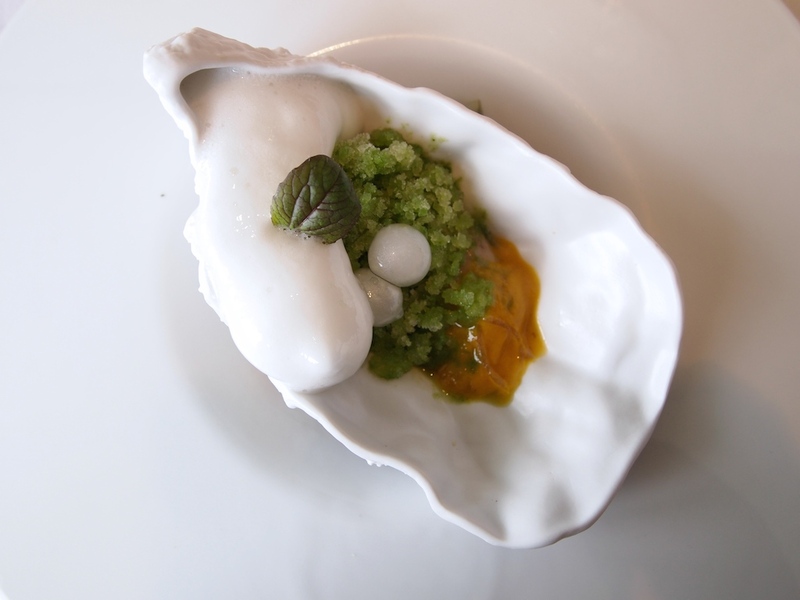 The first course of the tasting menu was a warm, marinated (Escabachada) oyster, lightly coated with the marinating juices, and served with liquid oyster spheres, spiced apple foam, and a boozy and refreshing Txakoli and cucumber slush. A wonderful dish with pure flavours, the Escabechade juices adding a nice touch of warmth. Great textures too, especially the creamy almost Italian meringue-like texture of the apple foam. 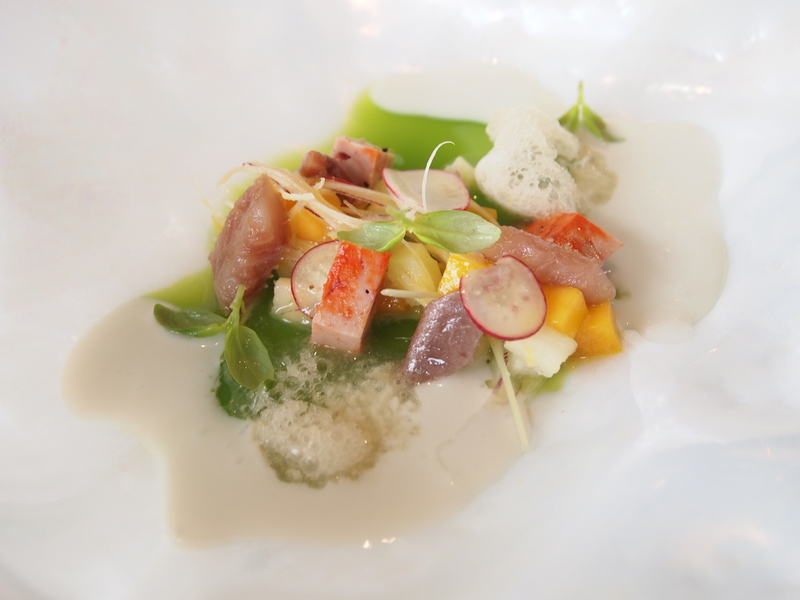 Second course was cubes of creamy monkfish liver, marinated in "sea chlorophyll", served with some fresh anchovies, mango, apple, radish, very thinly sliced red onion, a light jellied seaweed sauce, and a creamy sauce flavoured with lemongrass and a touch of coconut. An attractive dish with pleasing flavours and textures, the sliced red onion adding some sharpness and the coconut giving the dish a nice round finish. Next up was a dish called "The Truffle". A foie gras mousse coated with black mushroom powder was made to look like a truffle, and served with a light and creamy mushroom foam, a fermented mushroom cut into the shape of a cockscomb, some cabbage, and a rich mushroom and truffle royale (puree), that had been beautifully flavoured with a hint of chilli, creating a nice piquancy that lifted the flavours. 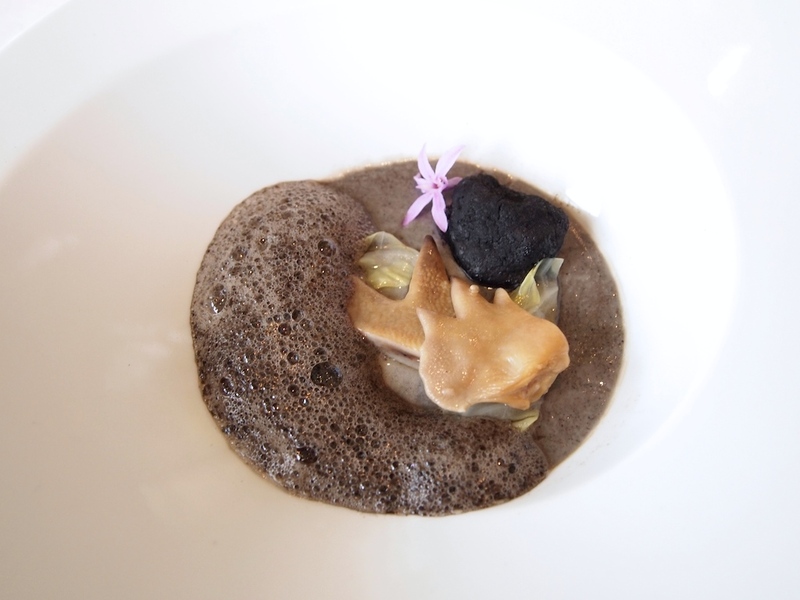 An indulgent yet light dish with a terrific interplay of earthy mushroom flavours. The mushroom-truffle royale had great depth of flavour, the foie gras brought a lovely richness to this dish and the fermented mushroom added texture and contrast. Fourth course was a beautiful composition of salad leaves, macadamia nuts, broad beans, cherry tomatoes, avocado rolls, a jellied vinaigrette, lobster, flowers, and a few drops of "iodized juice" (a salad cream, flavoured with shellfish). A great assembly of exquisite ingredients with precise seasoning, lovely bright flavours and textures, and with no "greenness" whatsoever. 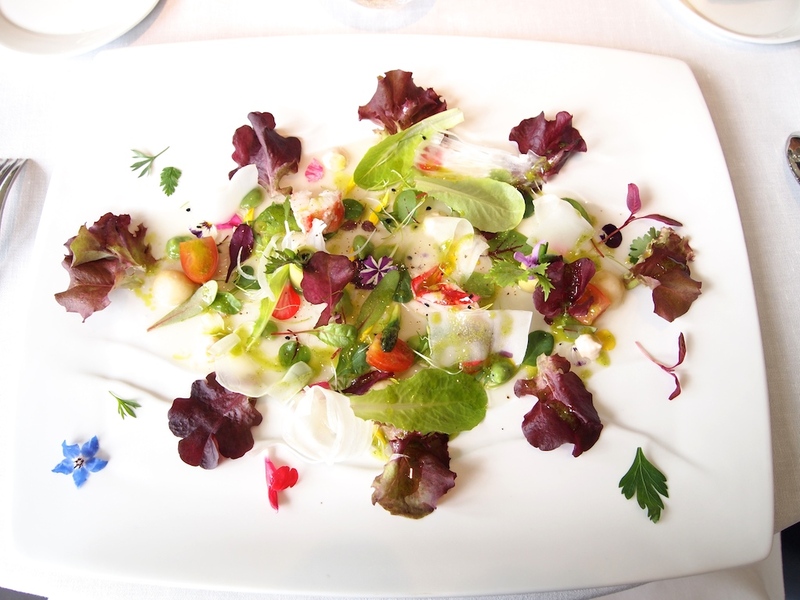 A dish that captures the beauty of its natural ingredients perfectly. This was followed by a distinctive and intricate dish of "Gorrotxategi" poached egg yolk served on top of a "liquid herb salad" (a liquid green herb cream) and covered with Iberico pork carpaccio. 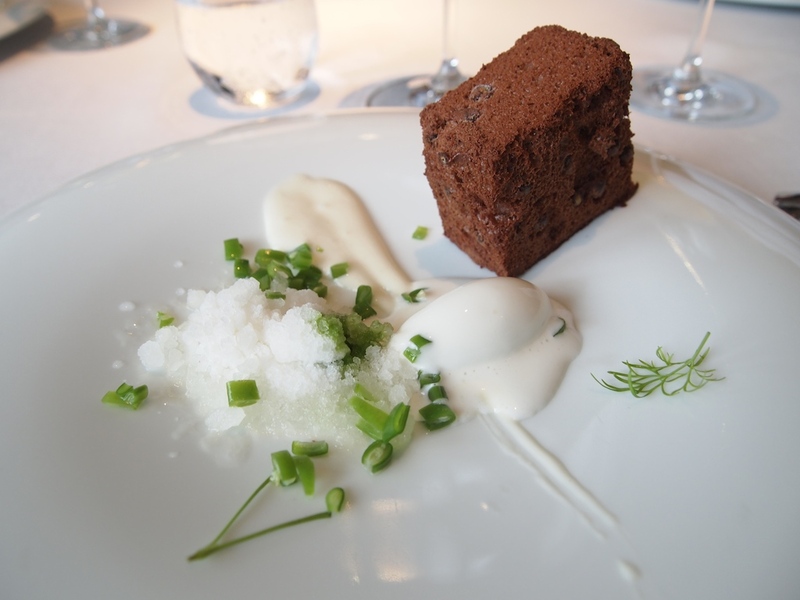 Hidden underneath the herb cream was a slice of beetroot with an almost beef-like texture. A delicately balanced and satisfying dish. Lovely richness from the egg yolk and the herb cream delivered a nice light contrast. Even better was the sixth course, baby scallops served with an aniseed cream sauce with finely chopped chard stem. On top of the scallops was some shaved fennel and a fish skin crisp. A dish with very attractive, rich and comforting flavours and the aniseed flavours from both the sauce and the fennel enhanced the natural sweetness of the scallops nicely. Lovely contrast of textures too. Seventh course was an excellent piece of red mullet covered with crispy scales and accompanied by a gorgeous cuttlefish and red wine stew, a beer foam, a crunchy beetroot "rock", and some celeriac velouté. The stew was of exceptional quality, the sauce having an almost syrupy consistency, great depth of flavour, and the cuttlefish was wonderfully tender. 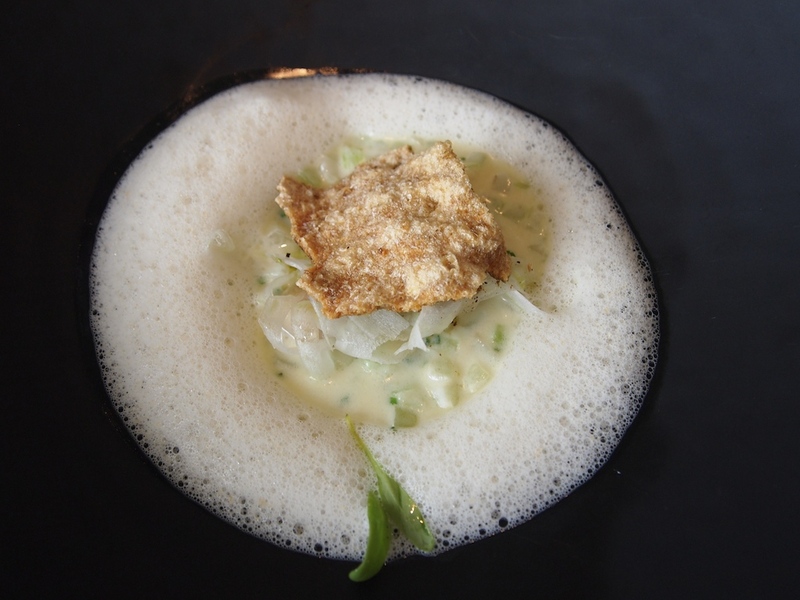 In addition, with a little help from the mild bitters in the beer foam, the red mullet was more than capable to take on the distinct and rich flavours of the stew. The meal continued with wild rabbit "a la Royale", simply served with some mushrooms, a slice of potato and bacon gratin, and a few dots of potato cream. The rabbit was wonderfully moist, as it should be, and the Royale sauce (thickened with rabbit blood) was fabulously rich and shiny. A highly decadent and technically brilliant dish with beautifully balanced, full-bodied flavours. Then there were two desserts. 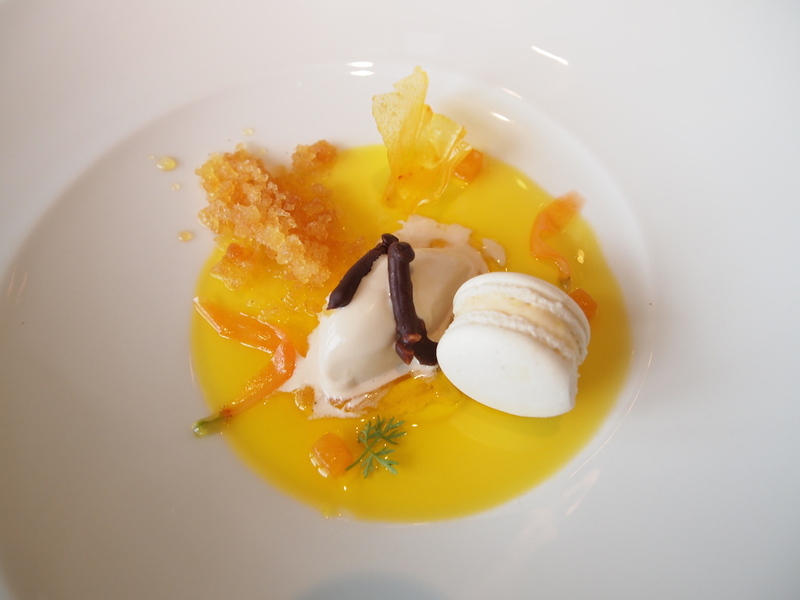 First up was a lovely, refreshing dessert of delicate tea flower ice cream, served with a sweet saffron-flavoured bouillon, some honey granita, and a truly delicious hazelnut and orange macaron. Second dessert was frozen chocolate sponge with smoked chocolate chips, served with whisky ice cream, mint granita and chopped green beans. A really lovely dessert, both comforting and refreshing the palate. 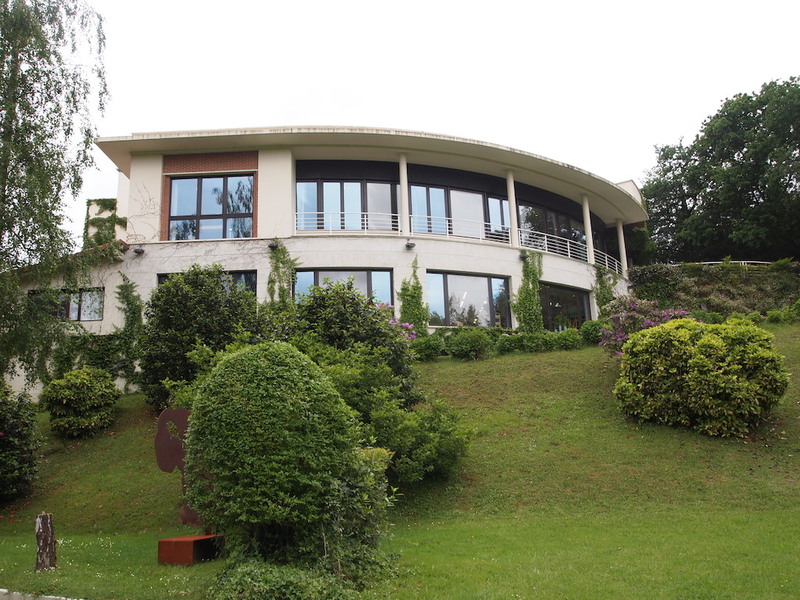 Martín Berasategui is internationally renowned for flying the flag for modern Spanish haute cuisine and his hillside restaurant was and still is one of the main attractions for gastronomes visiting the Basque Country. The first time I encountered Berasategui's cooking was at his Barcelona two-star restaurant Lasarte, which was a good but not a great experience. I can happily and safely say that with this lunch he has evened the score. Berasategui's cuisine is slightly theatrical in nature, with sometimes busy plates and quirky combinations, but generally executed with a commendable level of finesse. Almost all dishes were technically strong, with a good level of complexity, and it's great to see, that even after 14 years of three Michelin stars, Berasategui still manages to give most of his dishes a pleasant avant-garde edge.